← 7 Patio Must-Haves for Summer Entertaining! Chic and Cheap Spa-Style Bathroom Makeover! No matter what the size of your bathroom, you can easily transform it into your own at-home spa and private getaway with our simple hacks! A small, cramped, outdated, or démodé bathroom can quickly be flipped on a budget and turned into a mini stay-cation. There are a few things you should consider investing in, but you won’t need to break the bank for the majority of essentials – repurpose things you already have around the house! Bring in Outdoor Furniture and Blooms! 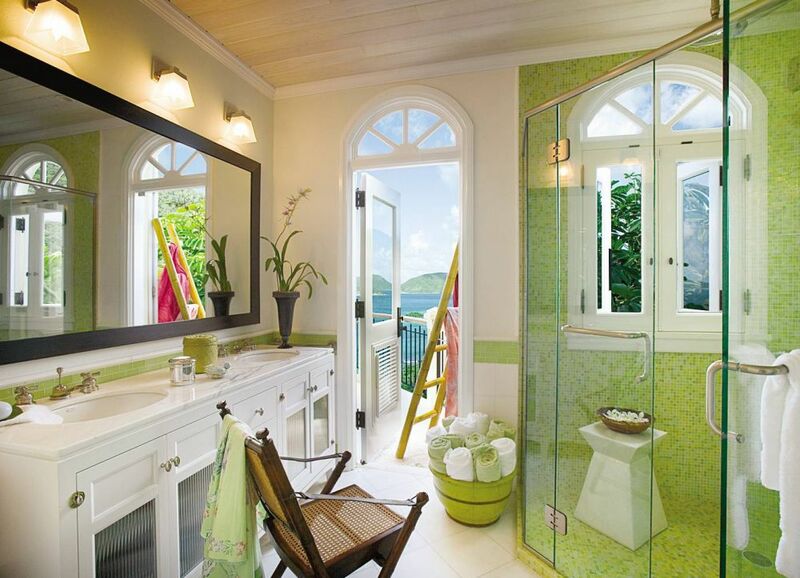 A touch of the outdoors is all you need to make your bathroom feel like a spa-like oasis in a snap! Bring in one of your garden stools or pedestals and place a vase with a few fresh flowers. You’ll be surprised how a little bit of greenery can amp up your mood! 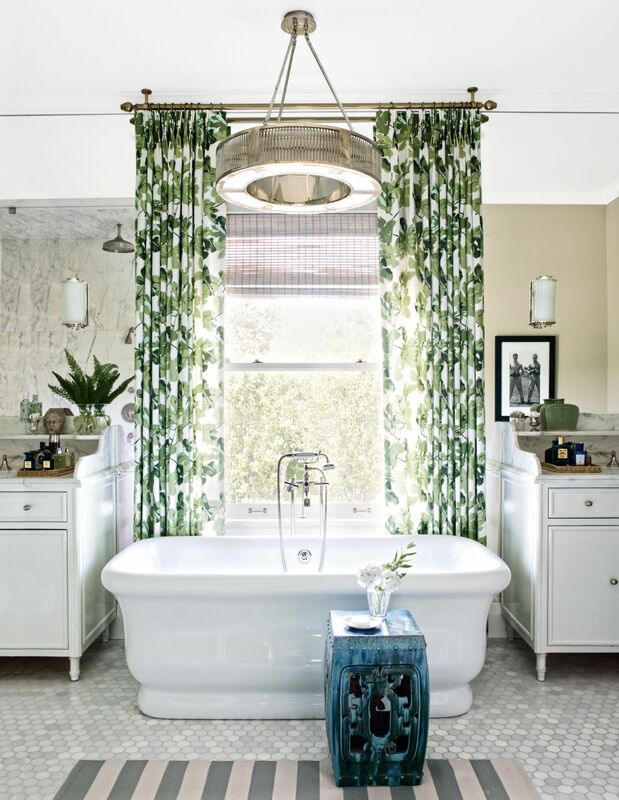 Most bathrooms have blinds or roman shades, but nothing screams luxury then super long drapery in a juicy floral pattern! This bathroom would be nothing without these leaf printed drapes dropping all the way to the floor. Even if you may have a smaller window – hang your curtains well above the window and let them go all the way to the floor. Your window will seem a whole lot bigger! Whirlpool baths are an amazing and worthy investment for your bathroom remodel. They will help you wind down after a long day of work and are also really good for your overall health! Not to mention they can significantly increase your home’s value if you are planning on selling in the future. I recently ordered a whirlpool bath from UK Bathrooms and it’s absolutely amazing – they stock a wide selection of high end and luxury brands as well as well-known and affordable ranges. Some Stats! : I was taking a look at some studies recently conducted and they revealed that the majority of homeowners would love to recreate an at home spa experience with a whirlpool bath or sauna/steam shower! When over 1000 residents were asked, “What would be their favorite spa feature in their dream bathroom?”, the results were exactly what we thought: Hydrotherapy/whirlpool baths came in at 65%, sauna/steam shower 55%, sensory shower 38%, massaging showers 46%, and foot spa 28%. I really couldn’t agree better – a whirlpool bath certainly is a must! 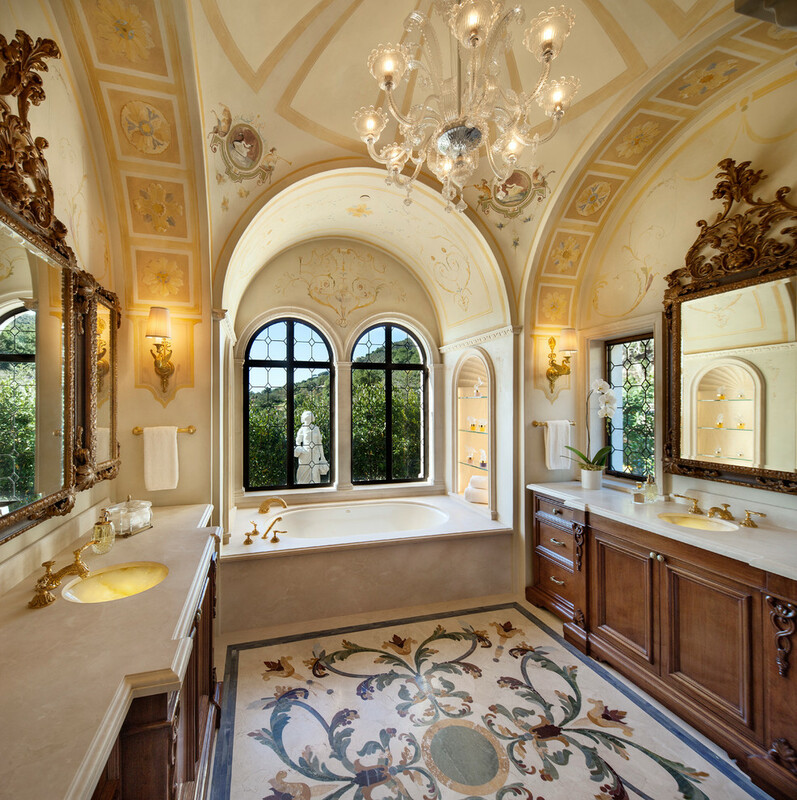 This bathroom is not only for taking baths – you could practically live in here! 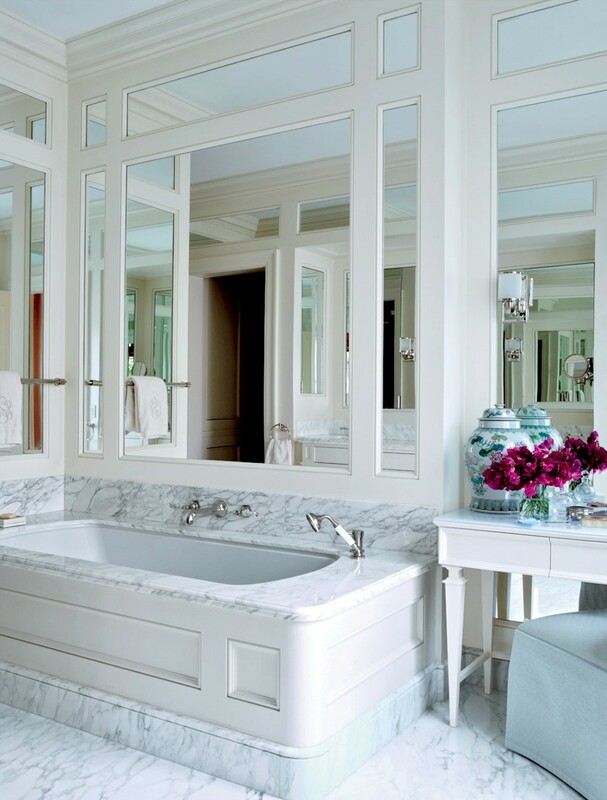 If you are lucky enough to have a big enough bath, transform it into your own personal getaway. A TV, fireplace, and a nice comfy chair is all you need to turn your bathroom into a secret stay-cation where no one can bother you! Long gone are the days of having a dinky hanging bathroom mirror – wall-to-floor mirrors are all the rage with todays designers! Creating mirrored panels or even applying mirrored tiles to your walls is a DIY anyone can do and it’s the perfect way to bring in a load of light! 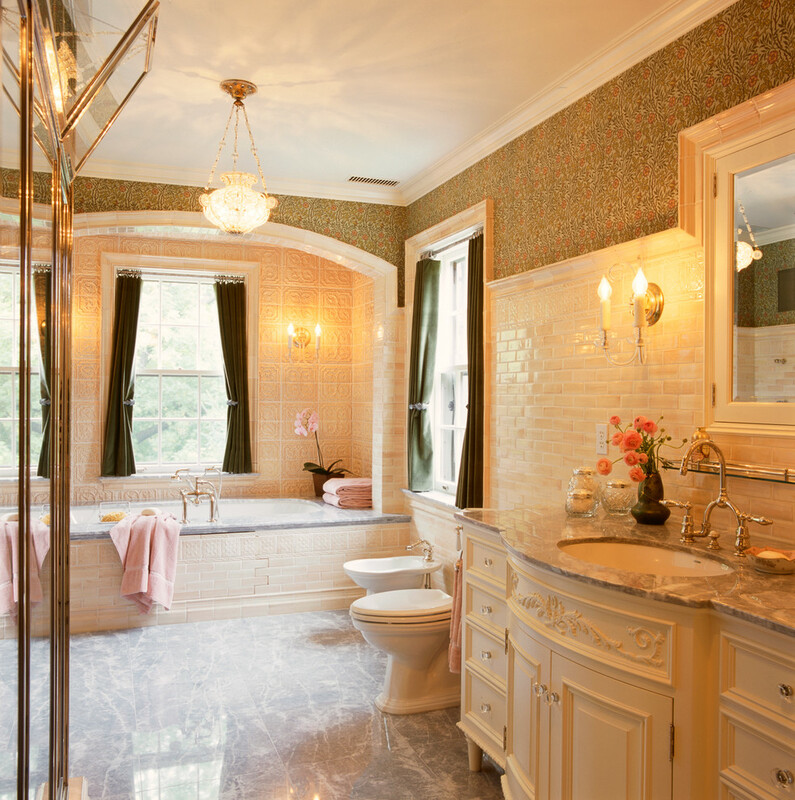 Order some pre-cut mirrors or even buy plain peel-and-stick mirror tiles to mimic this look. 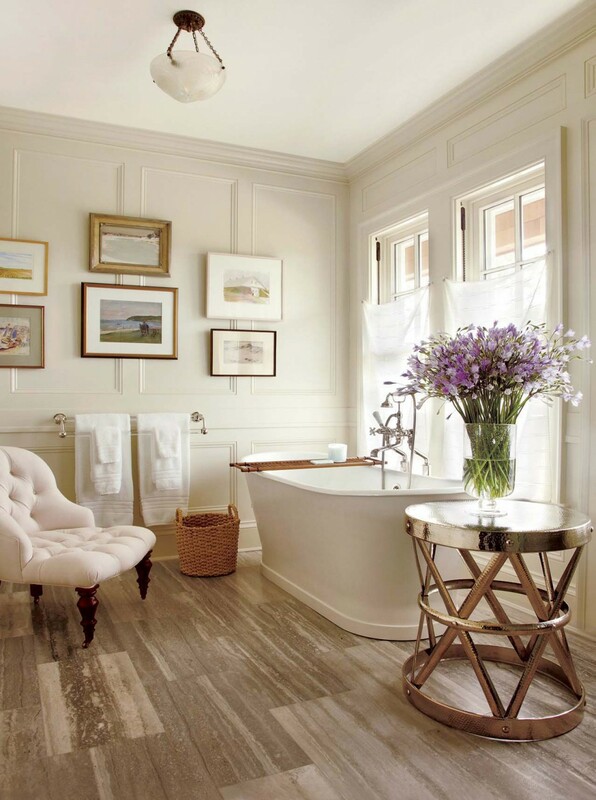 You probably have a few pieces of artwork or framed photos that you really can’t find the place to put – your bathroom makes the perfect spot for something like this. Create a “saloon wall” with mix-matched frames for a warm homey atmosphere. This entry was posted in Bathrooms and tagged better decorating bible, ideas, spa bathroom, turn your bathroom into a spa, whirlpool bath. Bookmark the permalink.